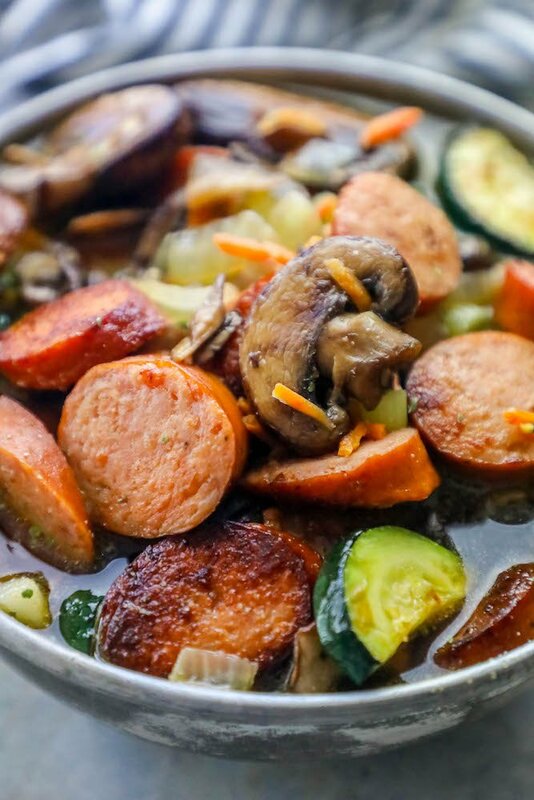 Low carb spicy sausage vegetable soup recipe – an easy, delicious andouille sausage and mushroom soup bursting with flavor and naturally keto diet compliant. 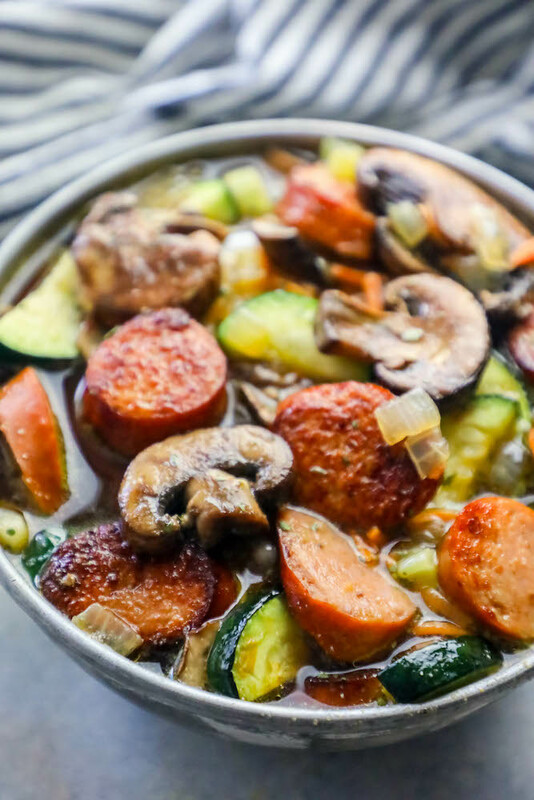 Starting a low carb diet can be hard – especially a keto diet – but this simple, hearty, and delicious spicy sausage vegetable soup is completely comforting and tastes indulgent! 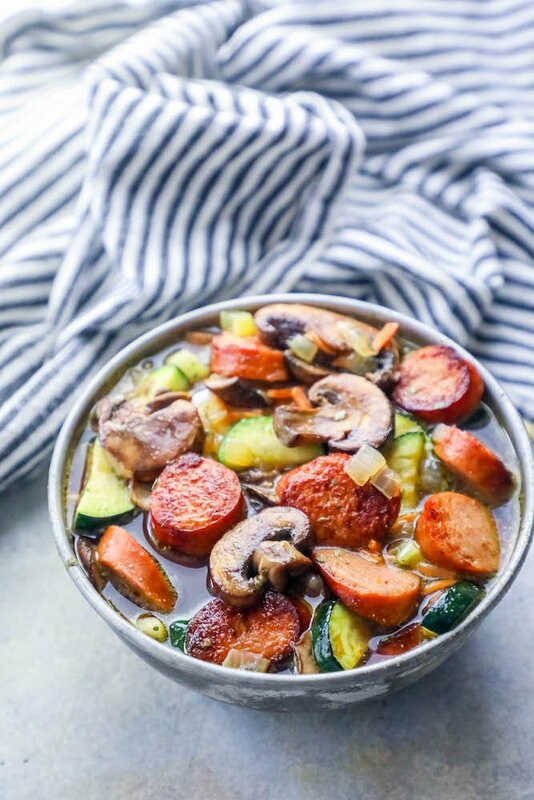 This andouille and vegetable soup is simple, hearty, and bursting with flavor – great to fill you up and fuel you without breaking your diet goals or throw you off track of a low carb diet. This soup is great for getting in extra vegetables even if you’re not on a diet – the rich, meaty flavor helps this soup eat like a big dinner – and helps you feel like you’re spoiling yourself eating vegetables. It really is that good – I hope you love it as much as I do! 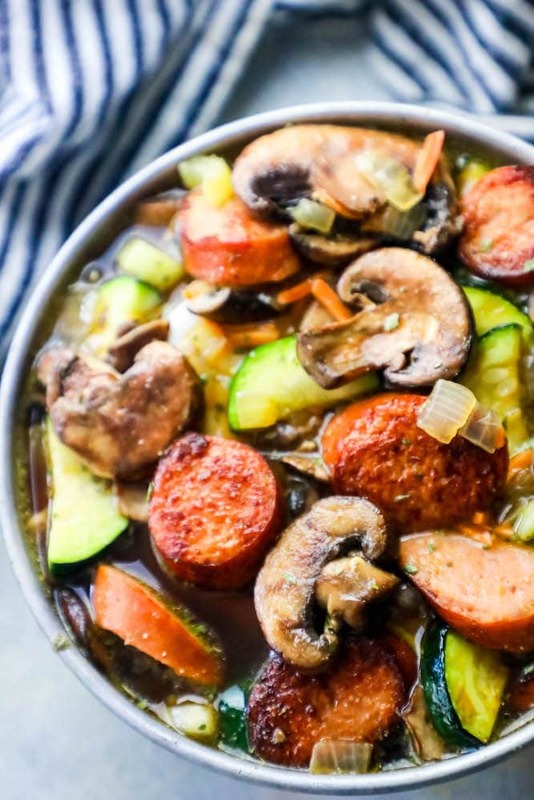 Just take me to the Spicy Sausage Vegetable Soup Recipe Already! 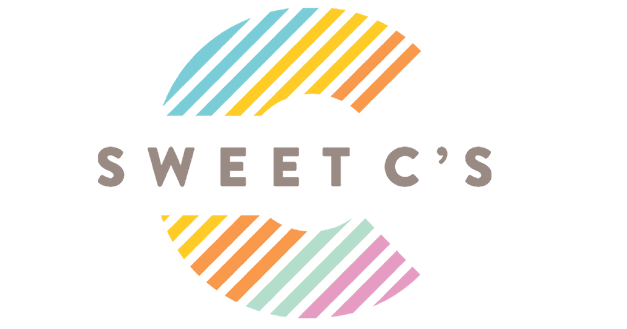 If you’d like to get straight to the easy printable recipe and zoom past my helpful tips and tricks and similar recipe ideas, please scroll to the bottom of the page, just above comments. I get a lot of questions on posts, so I try to pack them full of info! Since this soup uses easy to find ingredients – that are very inexpensive when buying in bulk – it is a great soup to make ahead in a big batch and freeze in portions, especially if you’re making a low carb soup for one. Not all vegetables freeze and thaw well, so I am giving my top tips to a delicious soup both fresh from the stove – AND reheated from frozen! Don’t cook soup all the way to done if you’re freezing it – and try to brown your vegetables quickly, so they are browned but not soft. Reduce soup some, but leave a good amount of liquid, so that when you reheat the soup you can reduce it more. Cool soup completely, then ladle into large freezer ziploc bags. For easier defrosting, lay the bags flat on a cookie sheet and freeze until set – about 5 hours. When soup is frozen flat, you can move it around the freezer wherever you have more room. Keep frozen for up to three months. To heat from frozen, let thaw naturally in refrigerator. Add to stock pot, and bring to a low rolling boil. 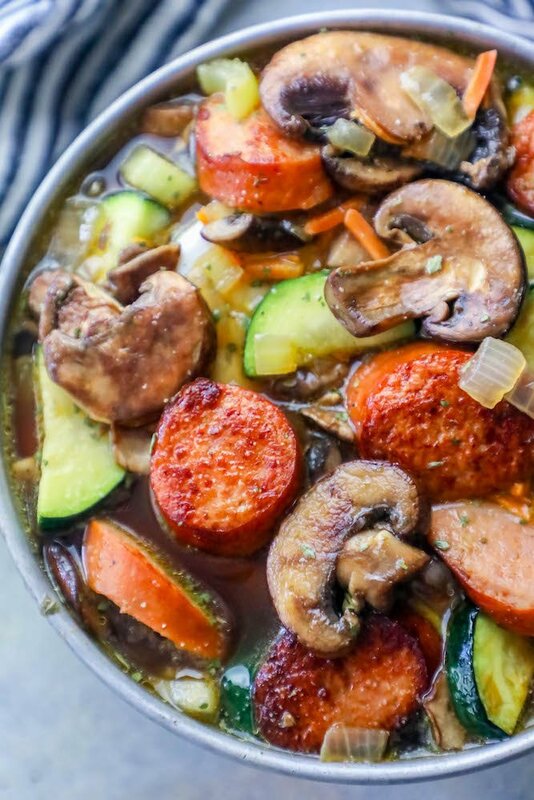 Not everyone loves every vegetable – and thats just fine with this recipe! I developed this soup to be a hearty showstopper, no matter what you add to it – so you can go ahead and toss in some of my suggestions below and switch out things you like more. Don’t have some ingredients on hand? No worries – just find something below that you do! 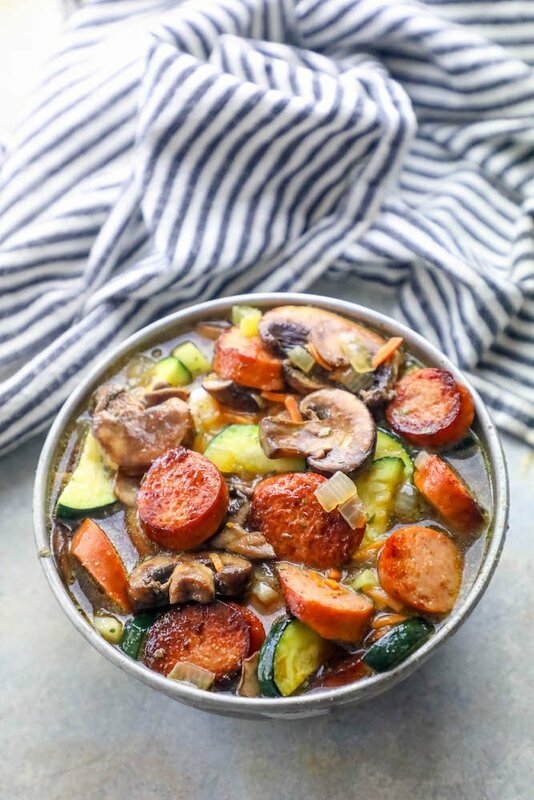 If you love this Andouille Sausage and Vegetable Soup Recipe as much as I do, please rate it five stars and help me share on pinterest and facebook! 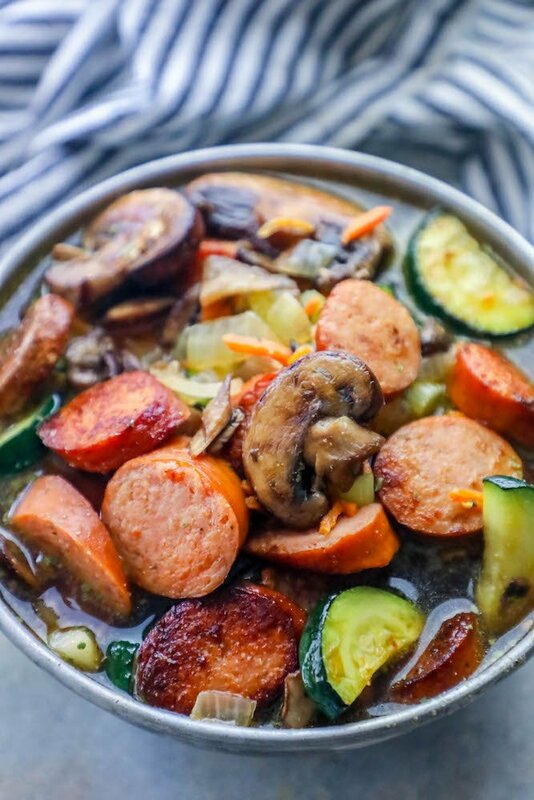 Low carb spicy sausage vegetable soup recipe - an easy, delicious andouille sausage and mushroom soup bursting with flavor and naturally keto diet compliant. In a large stock pot or dutch oven, add olive oil and heat on medium until light and shimmery. Add garlic, celery, and carrots, and continue cooking for another 5-10 minutes, stirring occasionally, until fragrant, soft, and lightly browned. 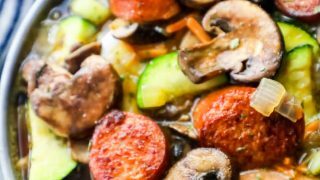 Stir in sliced andoille sausage, mushrooms, and zucchini, and heat until they are lightly browned as well. Season vegetables and meat with cumin, salt, dried oregano, and pepper. Slowly pour in beef broth, scraping up any browned bits from the bottom of the pan. Stir well and bring to a rolling boil, let reduce for about 5 minutes. When soup has thickened slightly, remove from heat and ladle into bowls. This calls for 1/4 CUP of garlic – is that right? That is like 12 cloves. I am one of those people who cant get enough garlic – but you can easily cut the garlic in half (or less) according to your tastes. I am sitting in the Seattle airport wishing I had a huge bowl of this in front of me! Wow this looks so flavorful! I can’t wait to make this. I’m 100% in love with this soup. It has everything I love in it and so comforting. Thank you! We LOVE soup in the fall and this one totally hit the spot!